After visiting 13 European countries in 2017, we are now looking forward and planning our 2018 adventures! Although, I, James couldn't do anything to do with this one! Christmas Day morning was made extra incredible when I opened a Willy Wonka style golden envelope to reveal... something I had to scratch to reveal where we are going to in just a couple of weeks time. Thank you so much to my amazing travel companion and girlfriend Jessica for planning this! We can't wait to share our time over in Portugal with you all, so keep updated on Twitter, Instagram and our blogs and YouTube once we're back! Ahhh you’re going to LOVE Lisbon! I was there last summer and really fell in love with the place, Portugal is just so beautiful and full of history and culture! I can’t wait to hear all about your travels! Ah we can’t wait! James has been to Portugal before but not to Lisbon and I haven’t been at all. Do you have an recommendations? 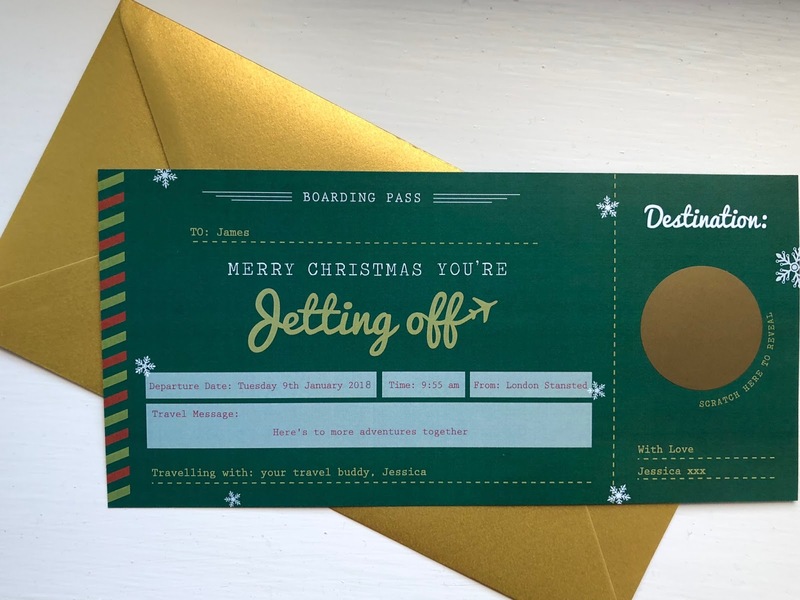 This is an amazing way to give travel as a gift. Where did she get this from/how did she make it? Have an amazing time in Lisbon! Thank you! I got it done on notonthehighstreet.com, just provided the information and they sent it over! Awh that's such a cute way to give you your gift. I'll have to steal this idea for a present one day! We cannot wait to go and share it with you all too! That is such a cool way to reveal it! I'd love to do some more travelling, even if it is just within the UK. I can't wait to read about your trip! Travelling is the best, we’ve done a bit of the UK but we defo want to do more! What an amazing gift that you’re able to do that for the both of you! I don’t think anyone would ever go through the trouble of buying me a holiday as a gift! So you’re very lucky. Have an amazing time and I cant wait to see all the posts and the food! We’re so excited and we can’t wait to eat all the traditional foods and share it will you all! Ooooh yay! How exciting, we hope you have the best time and hopefully we’ll have lots to share with you! Actually very proud of the way I’ve found this way to present it! so cute! can't wait to read all about your lisbon adventures!! Eeeep thank you! Can’t wait to share it all with you!